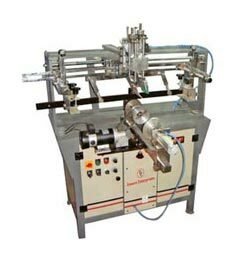 The company is enlisted among the topmost Manufacturers, Exporters and Suppliers of Semi Auto Deluxe Round Screen Printing Machine in Haryana, India. Our Screen Printing Machine can print all kinds of round objects that have diameter upto 5 inches. Our Screen Printing Machine is ideal for printing 2000 impressions per hour. The Semi Auto Deluxe Round Screen Printing Machine that we offer is easy to operate and require low maintenance.